Can this sensor-filled fitness tracker really do it all? The Microsoft Band has the potential to be the best fitness tracker, but the lack of apps and its overhyped Health platform aren't quite there yet. Update: The Microsoft Band 2 is out now and solves a lot of the problems we had with the original Microsoft Band. But the sequel does cost a bit more - so be sure to read through the rest of our original Microsoft Band review before you decide what to buy. 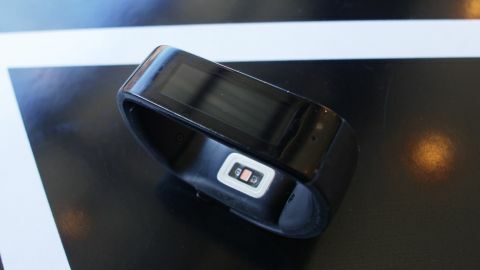 The original Microsoft Band hasn't been totally outpaced by its successor in terms of feature updates and speed, but as you can see in our latest photos, it hasn't handled normal wear-and-tear all too well. Regardless of its looks, the Microsoft Band still holds up as a good purchase for both new and current owners alike. If you're a fitness nerd who loves tracking multiple metrics with insane detail, you can't go wrong with Microsoft's debut wearable. What's better is that it's cheaper than ever now that it has a successor. Read on for our full review of the Microsoft Band. Microsoft quickly and quietly launched its Microsoft Band when no one was really expecting a wearable. The company promptly released the sensor-intensive Microsoft Band after its announcement (without much fanfare, with a price tag of $199 (£170, around AU$230). Despite the high cost, the ninja release and the Microsoft brand seemed enough to keep people curious and ravenous for the Redmond ware, which sold out quickly at its initial US launch. Sneaking into a growing ocean of wearables, Microsoft has a long way to go if it wants to remain a top contender in the fitness tracking competition. Jawbone already has the successful UP24, plus the UP3 coming out soon. Fitbit also has a lineup that's gotten the masses in a running frenzy, including the newest three of the brood - the Fitbit Flex, Fitbit Charge (and Charge HR), and Surge. Whew. Not to mention every smartwatch has some version of fitness tracking built in. With the space inundated, what's to keep everyone interested in the Microsoft Band other than brand name recognition? The answer is health, health, health. The 1.4-inch TFT (320 x 106 pixels) full color display screen is crisp and bright with no pixelation in sight. Its 11mm x 33mm is much smaller than the Samsung Gear Fit's curved 1.85-inch AMOLED screen. But you don't need a huge screen, since the fitness tracker isn't going to be showing off any intensive graphics. If you want this to be your smartwatch for reading and responding to emails, however, that display real estate might be a bit limiting. The Band's display is big enough that I can read everything clearly but small enough to remain unobtrusive. Not many fitness trackers even have screens, let alone colorful screens - except the aforementioned Gear Fit. The Fitbit Force, Surge and Razer's Nabu have simple OLED displays which are far less fancy than the Microsoft Band's. In most cases, this is perfectly sufficient considering a lot of fitness trackers are also simplified notification hubs. The Band also fits in this category but like the Gear Fit, it lets you read and reply to messages with generic pre-written responses - but not on the iPhone.